In the one-and-done era, coaches who recruit the most NBA-ready prospects have the best shot at the Final Four, right? Not necessarily. Subscribe now for in-depth coverage, only from Sports Illustrated. This story originally appeared in the March 21, 2016, issue. To Carlton, it might as well say participant. The Spartans went 10–18 that season. He felt as if he had a scarlet "L" on his uniform. He stopped going to parties. He celebrated a rare win, over defending national champion Indiana, by jumping on the scorer's table. People said he overreacted. He said, "You don't understand. We won." The losing hit Carlton like a screen he never saw coming. His high school team, DeMatha Catholic of Hyattsville, Md., won USA Today's national championship. His first two Michigan State teams went to the NCAA tournament. Carlton thought he was a winner because his teams won. But he came to realize sometimes most valuable is still not valuable enough. He was a 6' 6" back-to-the-basket- scorer, who averaged 13.3 points as a senior. He didn't set up shots for his teammates. He was just an adequate defender. He tried to lead, but without the ability to create for others, he didn't know how. Carlton would point to his lonely trophy, surrounded by pictures of other MSU teams celebrating championships, and tell his sons, "That's all you're going to see. If you don't win, nobody really cares." He did not force his boys to play sports, but he did tell them, If you do play, you will help your team win. In football, Denzel played tight end; Carlton shifted him to quarterback, where he could have a bigger impact. Drew, the elder by three years, played quarterback too. But basketball was their true love. Drew and Denzel were often the biggest players on the court, but when they played with their dad in the driveway, he pulled them out to the perimeter so they'd work on their ballhandling and passing. If they scored 30 points, Carlton would ask them, How many assists did you have? How many rebounds? Did you defend? 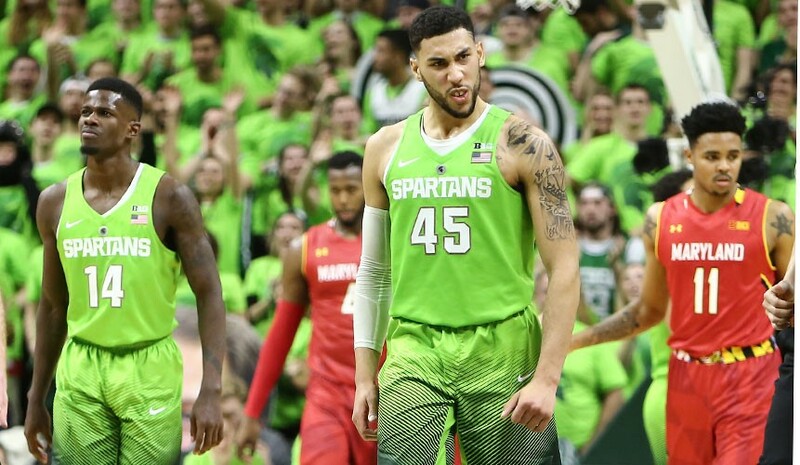 Now a 6' 5", 220-pound senior guard, Denzel has become one of the best players ever in East Lansing, the player most likely to carry his team to a national title in Houston on April 4. A versatile threat, a triple double waiting to happen, he has fulfilled his father's vision. But he has done it because of a gift that is entirely his own. 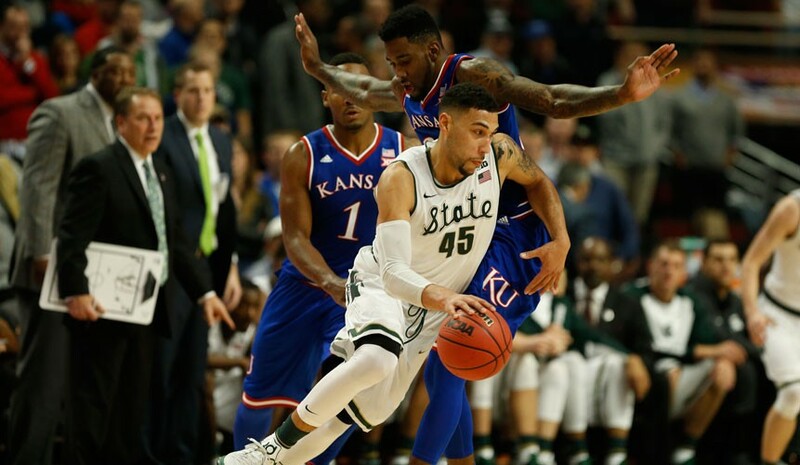 Denzel Valentine remembers the day he realized he was not like other players. He had the ball in a half-court set, with his back to the basket. The other team was playing a 2–3 zone. As a defender moved toward him, Valentine whipped a no-look pass over his head to an open teammate for a layup. The crowd roared. Valentine was in fifth grade. He didn't really understand why he made that pass until after it left his hands. He didn't see his teammate—Anthony (Sapp) Clemmons, now a senior guard at Iowa—cut to the basket out of the corner of his eye. He just knew that was what Clemmons should do. His subconscious did the math. Even in the NBA very few players think like this. Michigan State assistant Mike Garland says most players "can't read the defense and find the open man at the same time. They have to look at one or the other. What most guys do, they're looking for the open man. They're kind of search-lighting-, whereas 'Zel is reading the defense and throwing to a spot. He sees things that other people can't see. That's your Jason Kidd, that's your Magic Johnson, Bob Cousy. 'Zel has some of that." Valentine attributes this ability to his father's teaching and his own study of the game. But Drew's game was formed in the same lab and didn't grow in the same way. "He has extreme feel," says Drew, who was a 6' 5" forward for Oakland and is now an assistant at the Rochester, Mich., university. "Crazy feel. I can't explain it. He's been like that since he was eight. I don't know where it comes from. I had a really good feel for the game too, but him, it's something I've never seen before." In the Lansing area hoops junkies said Valentine played like another native, Magic Johnson. The similarities were not intentional; Denzel had never seen Magic play. They just have similar basketball minds. Valentine dominated every middle school kid in the area, but Carlton thought the competition wasn't stiff enough. "That's not real basketball," he said. "That's fool's gold." He had Denzel play games in Detroit, to toughen him up against better talent. Carlton coached both boys at Sexton High, where they shared the court just twice because they each suffered injuries in the one season they overlapped. In the final moments of one of those games, Denzel jumped into the air and threw a pass behind his head in traffic to Drew. It was a brilliant pass, but even his brother didn't expect it. The ball bounced off Drew's hands, and Sexton lost. Drew kept telling Carlton, "He's not showing off. That's just how he plays." With Clemmons and sharpshooter Bryn Forbes, Denzel led Sexton to two state Class B titles, and a paradox emerged: Valentine was so different from typical players, but because of the way he was different, he ended up looking just like them. You could watch him for a week and not appreciate how good he was. "I wasn't the most athletic guy," Valentine says. "I'm still not. Not the most talented guy." One or two monster dunks would have changed recruiting analysts' perceptions. Instead he just tried to help his team win and hoped that would be enough. On the summer circuit Valentine would feel like he outplayed a more highly regarded player, then check the ESPN100 rankings to see if he moved up. He rarely did. He finished 98th in his class. The Valentines met with Spartans coach Tom Izzo the summer before Denzel's junior year, expecting a scholarship offer. They got a challenge instead. Izzo told Denzel he needed to improve his shooting. The irony was rich: Carlton had implored his son not to obsess over scoring, and now the coach of Denzel's dream school was saying he didn't score enough. A future Hall of Fame coach had a future All‑America-—the son of a former team MVP—in his backyard, and he didn't appreciate him. But looking back, the Valentines are grateful. It kept Denzel hungry. He went straight from Izzo's office to a gym to shoot jumpers. A few weeks later he buried several threes with Izzo watching and earned his scholarship. But the coach still didn't know the full scope of Valentine's talent. 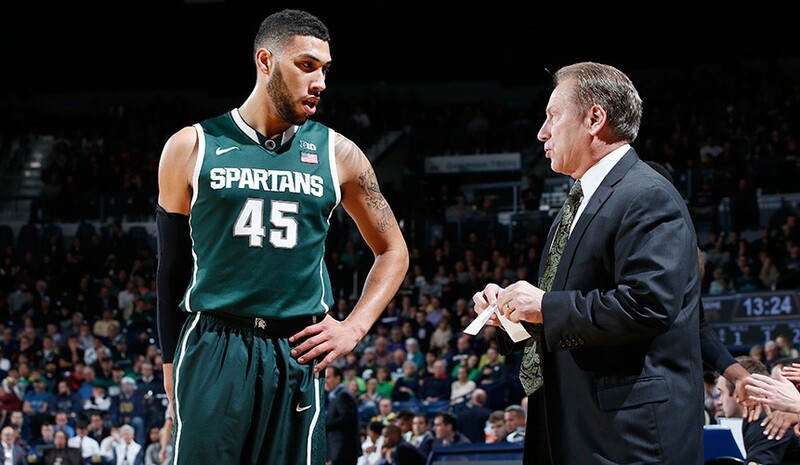 "You go watch him play, and there are days that you might hardly notice him," Izzo says. "I mean, I could go watch him, when he had Bryn and Sapp on his team, he would just throw it to them. [He'd] make some great passes, but he might score 10 points. It was hard to fall in love with him because he wasn't doing more. How stupid am I?" The term upside is used so often in sports that we often take its meaning for granted. Seven-footers have upside. Players with 42-inch vertical leaps have upside. We assume physical tools are God-given and mental skills are coach-taught. We rarely consider that brains have upside too. Michigan State experienced this a few years ago with Draymond Green, whose career path was remarkably similar to Valentine's. The Spartans hesitated to offer Green a scholarship out of Saginaw (Mich.) High. By the time he was a senior, he was as valuable as any player in the country. Now he is an NBA All‑Star and widely regarded as one of the smartest players in the league. If Valentine and Green had such limited athletic upside, why did they get so much better every year? As an underclassman, Valentine committed too many turnovers for somebody who was not a primary ballhandler, partly because his brain was operating at a higher level than the action on the court. Says Garland, "He's anticipating [what] the defense is going to do, but sometimes the defense makes a mistake and does the wrong thing." Valentine would throw a pass off a defender's arm, and people would think he was careless. Only he knew that the defender should not have been there. He has learned to blend his knowledge of what should happen on the court with what is actually happening. He honed his shot with tens of thousands of practice jumpers. (Drew taught him only to count the swishes, to ensure that he always has the proper arc on his shot.) Now the kid who didn't shoot well enough to play for Michigan State is hitting 44.7% of his three-pointers heading into the tournament. Valentine says that once a game starts it usually takes him one minute to gain an implicit understanding of the other nine pieces on the hardwood chessboard. Then he can begin working on checkmate. Izzo thinks Valentine is most effective playing off the ball, when defenses are not constantly watching him. But when point guard Lourawls (Tum Tum) Nairn Jr., missed seven games with plantar fasciitis in his right foot, Izzo put the ball in Valentine's hands and saw him put up the most well-rounded stat line in the country: 19.6 points on 46.8% shooting, 7.6 assists, 7.5 rebounds. With Nairn back playing limited minutes off the bench, Valentine's numbers have only improved. The coach's only real gripe with his star this year is that he is too nice, reluctant to stick a finger in a teammate's face the way Green or the captain of the 2000 championship team, Mateen Cleaves, would. Valentine pleads guilty by reason of vision. Sometimes he wants to tell Forbes, one of his best friends since childhood, that he missed an opportunity to make a great pass, but then he remembers: Bryn doesn't see what I see. NBA teams will fairly wonder if Valentine is quick enough to guard elite perimeter players. But his understanding of angles and tendencies is so advanced that he gets steals through anticipation instead of quickness. When Nairn was out, Izzo said of Valentine, "He's my best defender right now. He can do it with his brain. I don't know how to explain that." If Valentine's athletic limitations hindered him, then that would be most apparent when he faced the best teams. But this season he had 29 points, 12 rebounds and 12 assists against Big 12 champion Kansas; 30 points, five rebounds and 13 assists against Big Ten champion Indiana; and 19 points, 14 rebounds and eight assists against national title contender Maryland. Carlton is admittedly biased, but he thinks Denzel will be even better in the NBA, when he's playing with better players. Garland points out that pro defenders are more likely to stick to their assignments, because "if you don't get to those spots, you don't play." This frustrates players who rely on athleticism, but it may actually help Valentine. He will no longer be penalized for the sloppy habits of the other nine players on the floor. Another paradox: The harder the puzzle, the easier it is for him to solve. "Coach, I'm at the game. They're retiring Chauncey's jersey and [Rip] Hamilton is talking about them winning championships, and Chauncey's legacy. This is amazing to me. I want a legacy at MSU. I want to win. I want whenever we are in a tough game, it gets tough, I got to think of this stuff. . . . I got to start realizing what championships and legacies are all about." "In his mind," Izzo says, "he's playing for Magic Johnson, who did it. He's playing for his father. He's playing for Draymond, who spends all this time with him. I haven't had a ton of them [who] want to win for me and us, Michigan State. That's hard to find. I mean, I think that's really, really hard to find. That's what makes him special to me. He's obsessed with it." "Who is kidding who?" Izzo says. "This day and age you think every kid is here to win for Michigan State? That s--- ain't happening. Why fight it? . . . I want guys to have selfish personal goals, because I'll make those goals unselfish." Izzo has a group of nice guys and very good players who may go on to win the national title because of a single exceptional one. He says Valentine is "probably the most versatile" player he has coached, one who checks all sorts of boxes: passing, shooting, defense, vision, love of school, desire to be remembered. Izzo recalls that when Valentine got to talk to Magic at length at the NCAA tournament two years ago, "he looked like he was waiting for Santa Claus." That weekend the Spartans lost to Connecticut in the Elite Eight, blowing their best shot since 2000 at a national title. Immediately afterward Valentine told his father and mother, Kathy, "If I ever get back to the Elite Eight, I'm not losing." After Michigan State upset Louisville at last year's Elite Eight, Denzel immediately ran over to Carlton, hugged him, and said, "Dad, I told you." When he steps to the foul line, sometimes he thinks, I have to make this for my legacy. Yes: in the middle of a game. Some players would be overwhelmed if they tried to think about the macro and micro implications of a free throw right before they shot it. But remember, the harder the puzzle, the easier it is for Denzel Valentine to solve. And there are trophy cases in East Lansing that he wants to fill.